Joshua Trees tell you are truly in Mojave country. Though can grow 50 feet tall, they are not really trees but a species of yucca. They prefer flat or gradually sloping areas. The world's largest concentration of Joshua trees grows on Cima Dome in the Mojave National Preserve. Compare them with other yuccas that typically grow nearby. Banana yuccas, for instance, grow up to 5 feet tall and have long blue-green, curved spines. 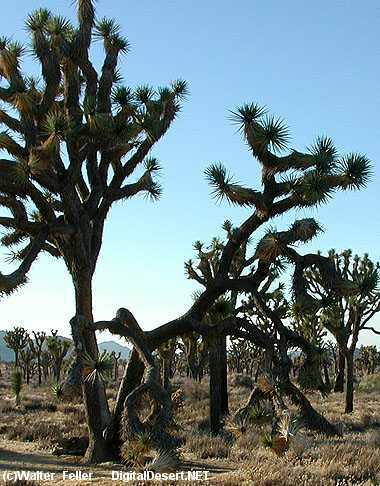 Mojave yuccas can reach 20 feet in height and branch above ground level. One of the Mojave's many lizard species, the desert night lizard, lives in decaying plant matter such as downed Joshua trees. Despite its name, this tiny lizard is diurnal but may be active after nightfall hunting termites. Insects, often attracted by flowers of the Mojave mound cactus and threadleaf groundsel, become food for birds. Joshua tree woodlands support species such as Scott's oriole and the American kestrel, a bird of prey.